The new Light Shield is here! What is the Light Shield, you ask? Well, it's a level light helmet bracketing system that comes with a pair of multi-purpose lights designed for almost any use. Each light 160 lumens, has 3 settings, and a fast strobe. 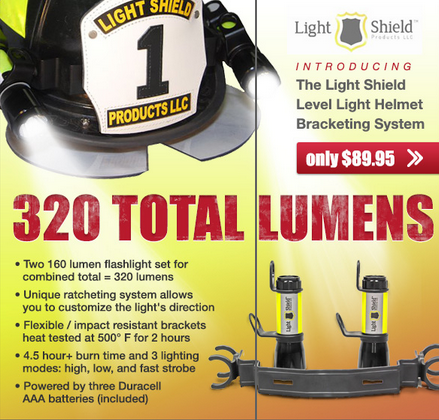 It gives you 320 Total Lumens shined conveniently from each bracket on either side of your helmet. The traditional bracketing system fits on most traditional style firefighting helmets (without full face shield) directly behind your number shield. The bracket will be held tightly into place leaving you no doubt that when you need your light it will be there. It is also equipped with a dual ratcheting system that allows two lights to be safely equipped at once. The ratcheting system will allow you to customize the direction or directions that your light will aim. It also comes with a two clips on each side that hold the light tight, but allow for self removal if needed. 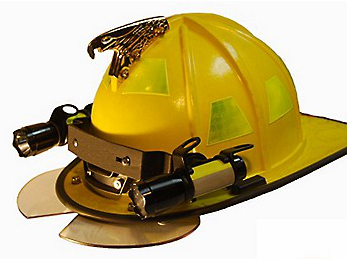 The non-traditional bracketing system fits onto the non-traditional firefighting helmets by attaching the bracket tightly to the outside rim of your helmet. The brackets come in packs of two and are completely reversible, so they can be used on either side of the helmet. The ratcheting system will allow you to customize the direction or directions that your light will aim. It also has two clips on each ratchet that hold your light tightly, but allow for self-removal if needed. Get your own Light Shield, today! These lights are awesome. This light system cuts through the smoke to give you good visibility in the toughest conditions.